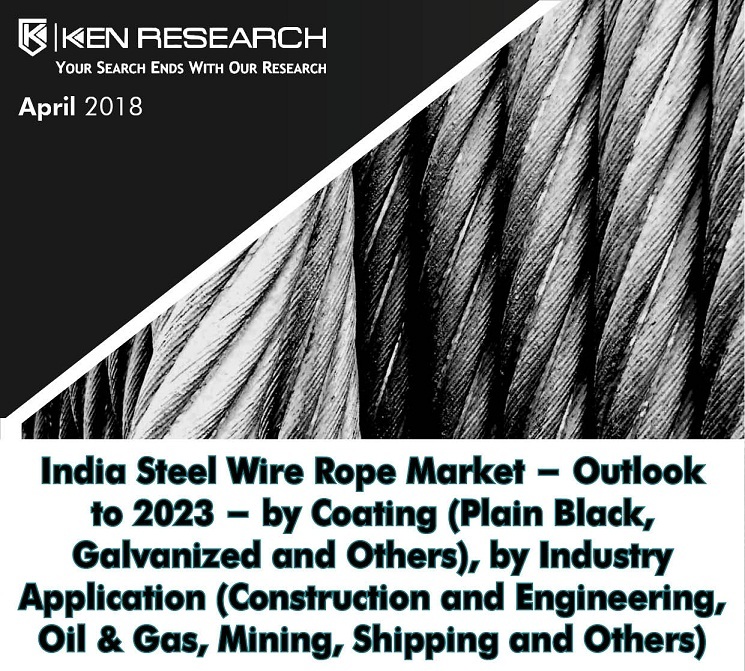 The report titled “India Steel Wire Rope Market Outlook to 2023 – by Coating (Plain Black, Galvanized and Others), by Industry Application (Construction and Engineering, Oil & Gas, Mining, Shipping and Others)” provides a comprehensive analysis on the India steel wire rope Market. The report covers various aspects including introduction and genesis to steel wire rope market, market size by value, market segmentation by Domestic and Exports Sales, by coating (Plain Black, Galvanized and Others), by Industry Application (Construction and Engineering, Oil & Gas, Mining, Shipping and Others), by Organized and Unorganized sector, by type of Lay (Regular Lay, Lang Lay and Others) and by Regional Demand (Western, Southern, Northern and Eastern Region). 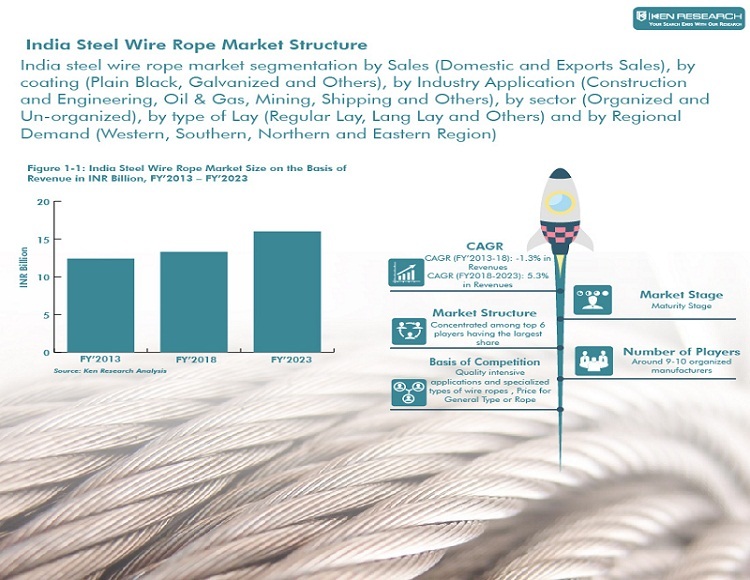 The report has covered major players in India steel wire rope market (Usha Martin Limited, Bharat Wire Ropes Limited, Bedmutha Industries Limited, Aradhya Ropes and Slings Private Limited, Asahi Ropes Private Limited, Orion Ropes Private Limited, Shree Steel Wire Ropes Limited and Mahadev Industries). The report also covers value chain analysis and inspection parameters in India steel wire rope market, government norms and regulations, order procedure of steel wire ropes in India, snapshot on smart city mission and influence on steel wire rope market, export and import trade scenario and analyst recommendation. This report will help the readers to identify the ongoing trends in the industry and anticipated growth in future depending upon changing industry dynamics in coming years. The report is useful for investors, potential entrants and other stakeholders to align their market centric strategies according to ongoing and expected trends in the future. The market for steel wire rope is at a matured stage, with a limited number of players dominating the market. Steel Wire ropes are used dynamically for lifting and hosting in applications, and for transmission of mechanical power. Steel Wire Rope industry in India has prospered owing to growth in infrastructure activities and demand in industrial sector. This growth was witnessed majorly due to government initiatives such as Pradhan Mantri Awas Yojana, Atal Mission for Rejuvenation and Urban Transformation (AMRUT), Smart Cities Mission, Delhi Mumbai Industrial Corridor (DMIC) and others. The primary growth drivers for steel wire ropes in India have been infrastructure development, increased industrial activity, enhanced emphasis on shipping and port sector along with growth in the mining industry. Domestic sales have contributed the maximum share to the steel wire ropes market in FY’2018. Domestic companies’ incapability of meeting international standards has been the proximate reason for fewer sales in the exports market. Usha Martin Limited, Bharat Wire Ropes Limited and Bedmutha Industries Limited cater to the needs of foreign market. Engineering and Construction segment has contributed the largest share in terms of revenues in FY’2018 from sales of wire ropes due to increasing government allocation on infrastructure projects like “Housing for All”, AMRUT and Smart Cities Mission. This was followed by the Oil and Gas Industry which contributed second largest share in terms of revenues in FY’2018. Plain Black Carbon Steel Wire Ropes segment has dominated the steel wire rope market in terms of production volume. The cost of black carbon ropes is more economical than galvanized wire ropes by 10-15% as they do not include the additional cost of zinc and associated production processes which appeals to Indian buyers. However, Galvanized steel wire ropes are more durable and hence they are exported to foreign countries or used in coastal areas domestically. Steel wire ropes use wire rods of black carbon steel, stainless steel or other steel alloys as raw material. There are various sub-segments of the steel types within these umbrella terms. Black carbon steel ropes dominate the market and account for highest production of the total in India steel wire rope market. The black carbon wire ropes are highly versatile and can be uncoated or galvanized. Stainless steel wire ropes are corrosion and rust resistant and are used majorly in marine applications. In FY’2018, unorganized players have dominated the market in terms of sales volume followed by organized players. Organized players have a production capacity of more than or equal to 500 tons per annum while un-organized players have a production capacity of less than 500 tons per annum. Regular lay wire ropes dominate the steel wire rope industry due to their versatility and accounted for maximum production of total production of wire ropes in FY’2018. Lang lay wire ropes are used in elevator and mining industries and made up for second largest production, whereas Alternate lay wire ropes accounted for the remaining share of the production volume. The Indian steel wire rope market is an extremely competitive market due to a mixture of increasing production of manufacturers and declining demand from user industries. The competition is more pronounced in the domestic market, due to a drastic reduction in the number of mines during FY’2015. Usha Martin Ltd. is the leading company in terms of revenues and production volume in India steel wire rope market. Bharat wire is the second largest company followed by Bedmutha Ltd. The other major companies in India steel wire rope market are Aradhya Ropes and Slings Private Limited, Asahi Ropes Private Limited, Orion Ropes Private Limited, Shree Steel Wire Ropes Limited and Mahadev Industries. Majorly the companies are following the two strategies which include increasing premium product portfolio and competing on high volume-low cost basis for base products. Indian steel wire rope market, in terms of revenue is expected to increase at a single digit CAGR during FY’2018-FY’2023 owing to infrastructure projects like Housing Projects, AMRUT, Smart City Mission and DMIC, along with resurgence in demand due to growth in mining industry as well as Oil and Gas industry. The resurgence in the Oil and Gas industry is expected to increase the number of oil rigs which will further add impetus to the growth of steel wire rope industry. Steel Wire Rope market value majorly depends on growth of end user industries and CAPEX been laid by private and public participants in the market. India steel wire rope market segmentation by Sales (Domestic and Exports Sales), by coating (Plain Black, Galvanized and Others), by Industry Application (Construction and Engineering, Oil & Gas, Mining, Shipping and Others), by sector (Organized and Un-organized), by type of Lay (Regular Lay, Lang Lay and Others) and by Regional Demand (Western, Southern, Northern and Eastern Region). Future investments in Swachh Bharat Mission and Housing for all by 2022 are expected to be key drivers for spiked demand in India DI & HDPE pipe market. As of FY’2016, Bosch was by far the market leader in India automotive fuel injection system market.